That’s all folks! 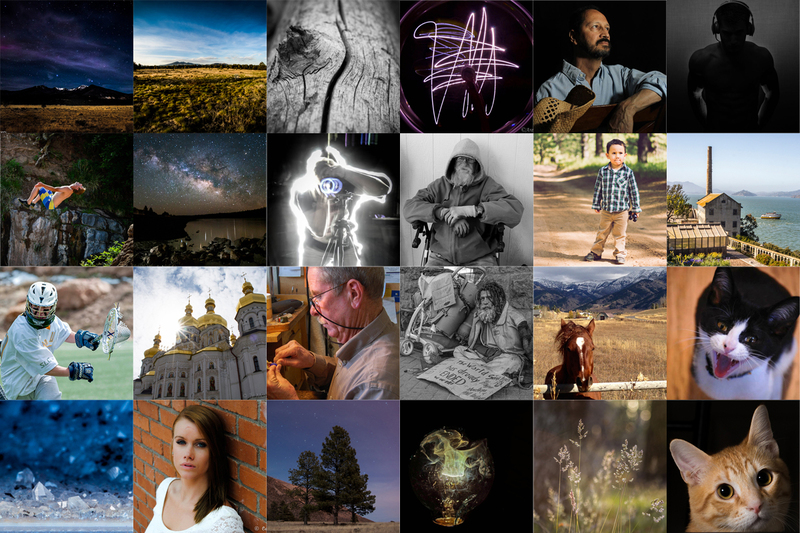 It’s a wrap on this year’s Northern Arizona Universtity’s Intermediate Photography students “Behind the Image: Guest Blogger” project. Let’s take a minute to give them a well-deserved round of applause for sharing their photographs and stories with us! Great job one and all! I’m most thankful to the students for tapping into their individual backgrounds and passions – whether it be travel, beloved pets, people who inspire, moving natural scenes, or intimate details of the world around them – to present a broad variety of visual message. At a time when we’re inundated with iconic and cliche images, these guest bloggers have proved and reinforced my belief that creativity is still alive and well in our industry (something I also feel is required of us if we wish to see success down the road as visual artists). To the participating students, what did you think of your blogging experience here? Would you do it again? Would you do anything differently in hindsight now that you’ve completed your assignment? Thank you for being awesome Guest Bloggers and keep up the great work in the future! I am also filled with endless appreciation for NAU Photography Instructor, Amy Horn, who helped coordinate this real-world assignment with her class. It’s truly a pleasure to work with someone so dedicated to her students and to facilitating the learning process in photography. Many thanks to those who took time out of their busy schedules to comment on the photographs and stories! For those of you who haven’t had the chance to review them, find the 24 “Behind the Image” write-ups by clicking on the “Guest Blogger” in the Categories box on the right-most column on your screen. Then, feel free to add your thoughts in the Comments section below anytime that’s convenient for you! While you’re at it, let me know what you thought about this year’s project overall by leaving us a comment on this post, as I value your opinions tremendously. What did you like about the photography as a whole? Did you get new ideas? Looking forward to hearing from you. Thanks again everyone! Until next time! I wanted to take photos of the stars and the night sky for some time now. I imagined a photo of a unique landscape with foreground perhaps a middle ground, and a background that was perfectly set underneath the night sky speckled with stars. I attempted to do so in the past, and failed miserably. For this task, a long exposure is the skill required for the completed image. I set out earlier this semester and I captured a few starting point images. I made some mistakes and learned what I needed to do instead. Here in lies the definition of working towards a goal of what one wants to have accomplished. When you have tried and failed, it is only right, that to hone skills, practice makes perfect. This image, as I called it “Grungy Night Sky,” resulted from another attempt at having the image I wanted of the night sky captured. I still, however, failed at the perfect image for what I had imagined the shot to portray. That said, this image shows the rawness of nature, and it provides the viewer with a sense of how important light is in the story of life and what it tells. To read more about the Northern Arizona University “Behind the Image: Guest Blogger” project on our blog, please read the introduction at youcansleepwhenyouredead.com/wordpress/its-back-the-2014-nau-photography-students-behind-the-image-guest-blogger-project/. I spent my Spring Break in Ukraine photographing the aftermath of the protests and riots that took place in February that prompted President Viktor Yanukovych to flee the country. 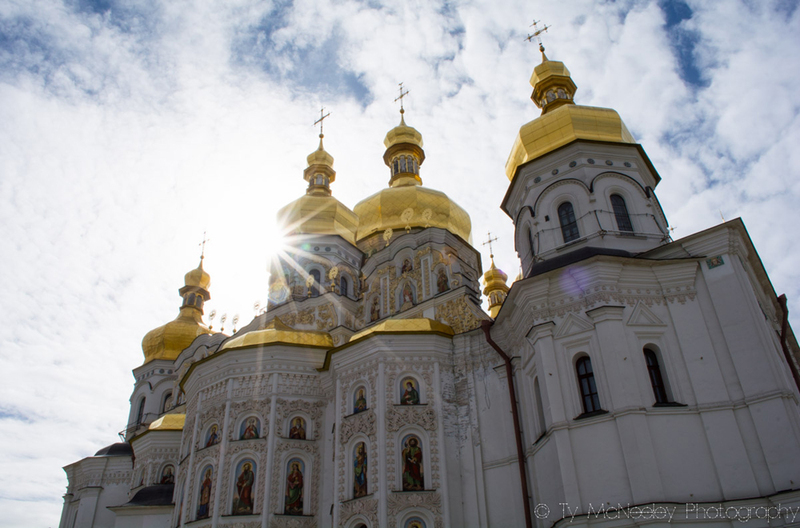 I was in Kiev while the Crimean referendum was taking place and I ended up with a lot of great photos from my eight days there. Most of my trip was rainy and cold with only a few moments of relief from the winds that cut through every layer of clothing. Because I didn’t want to spend my whole trip following self-defense forces around Майдан Незалежності (Independence Square) I took an afternoon trip to the Kiev Monastery of the Caves, an Orthodox Christian monastery where over a hundred people are buried in the complex system of underground corridors. After being in the area where so many protestors had been injured and killed it was a welcomed change to be somewhere as peaceful as a monastery. I knew when I arrived there that a sunburst photo would look great with the golden domes against the cloudy sky but I’d given up hope that the sun would appear that day. The wind was blowing very hard and the clouds were moving quickly across the sky. There ended up being one small window of time where the clouds separated just enough for the sun to shine through. Had anyone been there to witness my sprint to the edge of the shadow of the church to point my camera at the sun while taking tiny steps left and right, I’m sure they’d have thought I was crazy. After taking enough photos to ensure I had the shot that I was picturing the sun disappeared and didn’t return for two days. Since this was my only tourist-like stop on my trip I spent a few hours wandering the caves with a small candle as my light source. The silence of the tombs was relaxing and seeing the care that was taken with the mummified remains of saints was very moving. After I finished my time there I returned to Independence Square and was again surrounded by the sights, sounds and smells of revolution. This photo is my reminder of that amazing place and is an example that in places of hardship, beauty can be found. To get this photo I shot at ISO 200, 1/200th and closed my aperture down to f 22 to get the burst that I was hoping for. I took smalls steps left and right to increase and decrease the amount of sun that was visible while being careful to not stare directly at it through the viewfinder. In my photos I wish to capture the raw elements of human nature, either through abandonment or conflict. After seeing things in the military that I wished I could show the world, I decided to take that idea and make a career out of it. If my work can make someone appreciate their place in the world while bringing a bit of perspective about places they’ve never been I’ve accomplished my mission. Photography captivates me every time I pick up my camera. When I told my parents I was going to minor in photography they teased me about my luck with cameras in the past. I always take good care of my cameras, like an overprotective parent, but for some reason they never lasted long due to freak accidents and horrible luck. Vacuuming up a camera is not an easy task, but somehow my luck defied logic. My love for my cameras did not save them, but my love for photography motivated me to stick to it. Despite the horrible luck and the teasing, I spent the money on a Canon Rebel T4i and immersed myself in something that I love. Last month, I undertook a personal daily photo challenge, which provided the inspiration for this photo. Each day had a theme that the photo was supposed to capture or represent; for example, this photo symbolizes “patience”. Being one of the last days of the photo challenge, and about six photos behind, I was scrambling to complete my personal challenge on time. I grabbed my camera and three batteries, all partially charged, and ran out the door to capture as many photos as I possibly could. The natural light was diminishing quickly, and my battery life even quicker, so I found inspiration fleetingly and carefully. I snapped photos of anything and everything, hoping I had a product I could publish on my blog and proudly put my name on. To my surprise, my lack of time was a blessing. Because of the time restrictions, I focused on small details and stopped over thinking composition. Each subject got one or two shots and then it was on to the next. When I viewed my photos back at home, this photo caught my eye. It forced me to stop and appreciate the simplicity and instantly calmed my thoughts. With an ISO of 200, aperture of f/11, and shutter speed of 1/40, the original product provided enough detail without being overpowering. The black and white filter simplified it one step further and truly completes the image. When viewing this photo I take a breath, slow down, and find that inner calm that many could call “patience”. 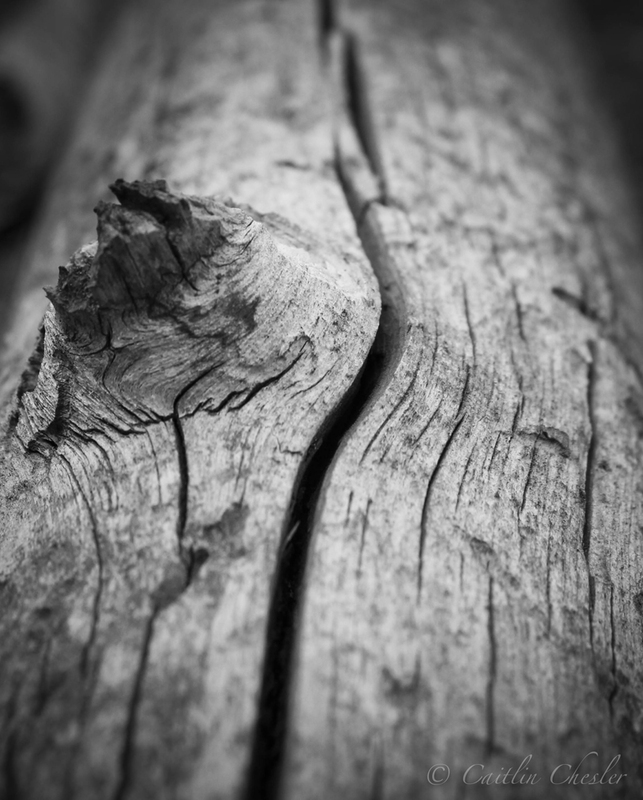 Life is hectic and spiraling which causes short tempers, but this photo gives the essence of peace by allowing the eye to follow the line of the bark all the way through and past the end of the frame. Much like life, we do not know what is past the edge, but we do know it is something worth exploring. My name is Caitlin Chesler and I am a photographer with a great passion for magnificence. Whether the subject is a landscape, object, or person, I strive to find the natural beauty inside and out. I am drawn to photos that allude to a place’s simplicity or a person’s inner confidence. When photographing, especially people, I focus on making the situation comfortable, fun, and entirely uplifting. To me, it is the experience of the shoot that produces the most memorable photos. The subject of this image actually inspired me to create this photograph. She was in a horrific accident and was left with significant facial damage. I wanted to take photos of her magnificent recovery and healing process. After two extreme plastic surgeries, there is only a scar on her forehead and under her left eye. She is also graduating from the College of Natural Sciences in the beginning of May, so why not hit two birds with one stone and take her graduation photos as well. After witnessing her accident, something inside me changed. I realized that anything could happen at any moment, so I started taking notice of the smaller things in life and living in the moment. And with her quick recovery, she inspired me to capture the moments as best as I could. My subject and I took this image in downtown Flagstaff, AZ while roaming around to find a contrasting backdrop to take her senior portraits. 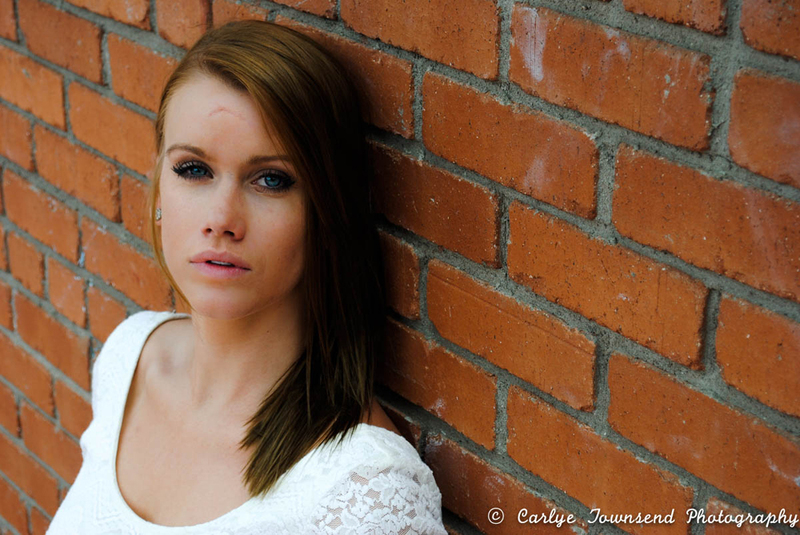 She found this beautiful brick wall that is on the side of a building and I took the image between the steps of a staircase that lead up to the entrance of the business. I took this image with my Nikon D3000 with a focal length of 55mm. I took this photo with an ISO of 100, aperture of f/7.1 and shutter speed of 1/125. I edited this image in Lightroom with only a couple slight adjustments. I softened the skin around her left eye and forehead to make her scars more defined. I increased the contrast of the image to give it a more rustic look along with sharpening it, so the details in the brick wall were more noticeable. I also love using the tone curve so I used that to brighten up the dark spots on the image along with darken the light spots. I am Carlye Townsend. I am a sophomore at Northern Arizona University. I believe that capturing life’s moments as they pass us by, evoke a sense of bliss that can be enjoyed over and over again. Through my photography, I strive to open a new world of photography that brings positive life back into fine art photographs. My goal is to capture moments that no one thought they could relive; I want to show people the value of living. I prefer portrait photography over anything but I do sometimes like to switch it up a little bit and take either nature or architecture photography. I love using Lightroom because not every image is going to be perfect when you take it. Mine definitely aren’t. Lightroom and even Photoshop help me correct the little quirks and allow me to add my own twists to the image. Since the time I was a small child I have been curious to a fault. I will get an idea and it seems to fester. No matter how hard I try, I cannot think about anything else until I have quenched my thirst for knowledge on the subject or an answer to my question. I once spent 3 months with a bottle of a mixture of shampoos and household cleaners hiding in my bedroom waiting for the concoction to eat through the bottle. It never happened, but at least I knew. I got myself into a bit of trouble a few times and from then on I have carefully planned out and researched all of my experiments thoroughly before carrying them out in real life. Then I went to Texas. I spent most of my time there driving and exploring the beautiful fields of hill country on the weekends and sitting in an office looking at numbers on a screen for weekdays. But I, being the social butterfly I am, made a single friend in my three month stay in Waco. On the last day of my visit I found that this friend was not as quiet and shy as I assumed to be because he turned to me in the car and said “do you want to learn how to make a wax bomb?” I was taken quite aback by this and honestly thought it to be a joke so I agreed. Long story short, large flames were created and a few hairs were singed. But I was left with so many questions from the experience that I just could not stop there. The way the “bomb” works is through rapid expansion of water to vapor by introducing hot wax to the system. This can be very dangerous if the wax is placed in a glass container because the glass will shatter with the drastic temperature change. I needed to know what else this could apply to. I thought for weeks, and then…light bulb. Literally. I could put cold water on a lit bulb and the light bulb would shatter. The glass is thin enough, the water is cold enough, light bulbs are hot, what could go wrong? 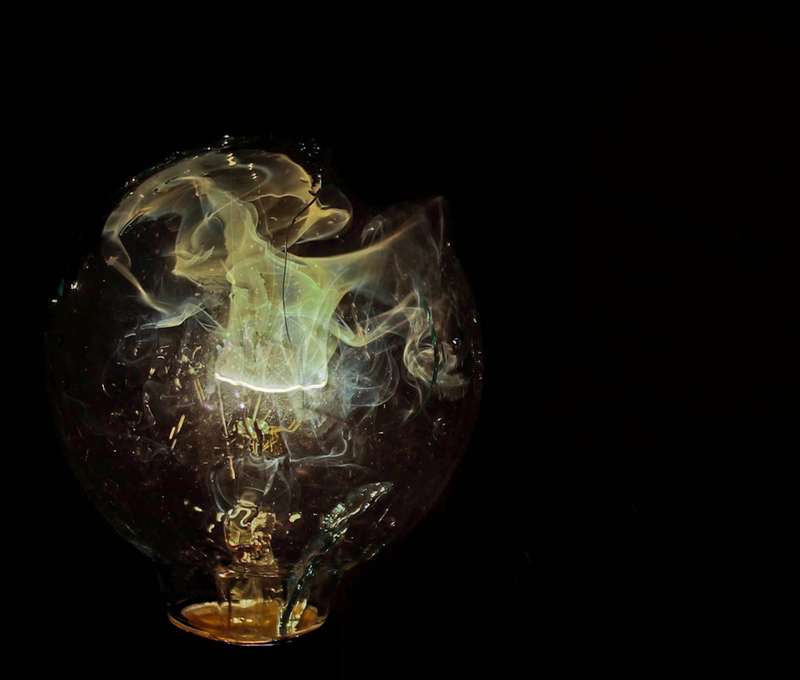 Once I had my experiment in mind, I took it one step further and decided to bring my trusty sidekick along for the ride to see what was actually occurring when (if) the light bulb exploded as I planned. I set up my Canon Rebel T3i on a tripod with a standard 18-135mm lens with a wired trigger remote in one hand and a water bottle known for leaking slowly filled with ice water in the other held over a small lamp with a bulb that had been lit for about 20 minutes. I dripped water on the first light bulb for about six seconds before it exploded. I was not so prepared as previously assumed. Glass was everywhere in my small bathroom and I was shoeless (but wearing goggles) and so shocked that I forgot to press the trigger button. I had three more bulbs to work with, so I gathered myself together and did it again. This time, success! The image, after a few moments in Lightroom editing for general exposure correction and a few more moments in Photoshop adding a few brushes to the smoke to make it a bit more “magical” and…well this is it. I am a photographer from the luscious deserts of Gilbert, Arizona. I enjoy exploring the trails of Flagstaff and doing research for the Chemistry department of Northern Arizona University when I am not taking photographs. When creating my images, I seek inspiration in the odd and unusual or just unheard of. I enjoy it immensely when people are awestruck by my photography and ask me how I created it. I want to make people feel as though they experiencing the thing they are seeing for the first time; a sort of “rearrangement of reality” is truly what I hope to achieve in each of my images. As an Exercise Science major, I can be very stressed and overwhelmed at times. During the middle of my 2014 spring semester, I needed a break from school and my Dad needed a break from the heat. My Dad planned on coming up on a Saturday to spend the day with me. 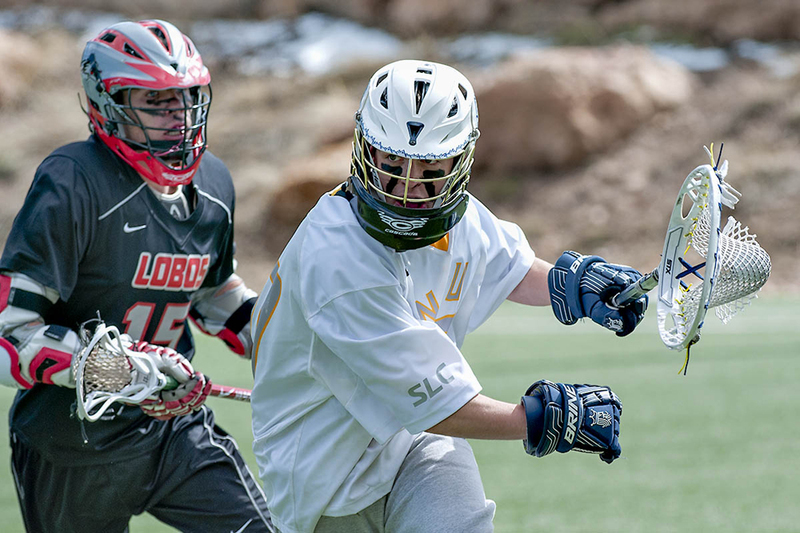 He receives emails from NAU saying what is going on and saw that there was a lacrosse game the day he planned to visit. Around the same time my Dad was coming up I had an assignment to write a “How to Article.” Even though I had no experience with lacrosse, I decided to write about it for my article. My senior year of high school I developed a passion for sports photography and thought the lacrosse game would be a great photo opportunity. I have never played or watched lacrosse before so I was not sure what I was getting myself into. My Dad and I got there at the tail end of their warm-up and started setting up the camera. I started out with my Nikkor 70-300mm lens because I was not sure where the action would be and I wanted to give myself some flexibility with what I could photograph. Since my Dad is also passionate about photography, he rented a Nikkor 300mm f/2.8 lens for me from Tempe Camera. I had never really used a fixed lens before so I was a little intimidated when I first used it. After snapping a couple of shots, I wished I had started with that lens. The fixed lens allowed me to open up my aperture to f/2.8, decrease my ISO to 200, and overall produce sharper images. Originally I was worried the lens was going to bring me in too close to the subject and I would have no room to work with when photographing. It turns out; some of my favorite images from the day were the close up action shots. You can see the intensity in their eyes, sweat dripping from their face, and capture the passion of the players. This is why I chose this image. It captured everything I want in an action shot. You have the main player in focus with the opponent breathing down his neck slightly blurred. This draws your eye immediately to the NAU player. Another aspect I love about this photo is that you can clearly see the ball in the players lacrosse stick. After photographing this image, it reminded me why I love photographing sports. It is exciting and a challenge; shooting hundreds of frames to finally capture that perfect moment. I capture this photo with my Nikon D300S, a Nikkor 300mm f/2.8 lens at 1/1250, f/5.6 and an ISO of 200. My name is Kelsey McHugh and I am an Exercise Science major with a photo minor. My love of photography began with my father and has carried on throughout the years. Throughout my photography career I have gone from landscape to sports action shots. I continue to challenge myself to try new techniques and practice till it is perfected. Continually I am inspired by my surroundings and look for photo opportunities to arise. I strive for capturing the defining moment where the light is just right and all aspects of a composition come together. This image was composed around midnight in early January. One of my close photographer friends, Jack, came up from Phoenix for the weekend to explore and create beautiful images. The moon happened to be particularly bright this evening along with an upsettingly cloudy night. 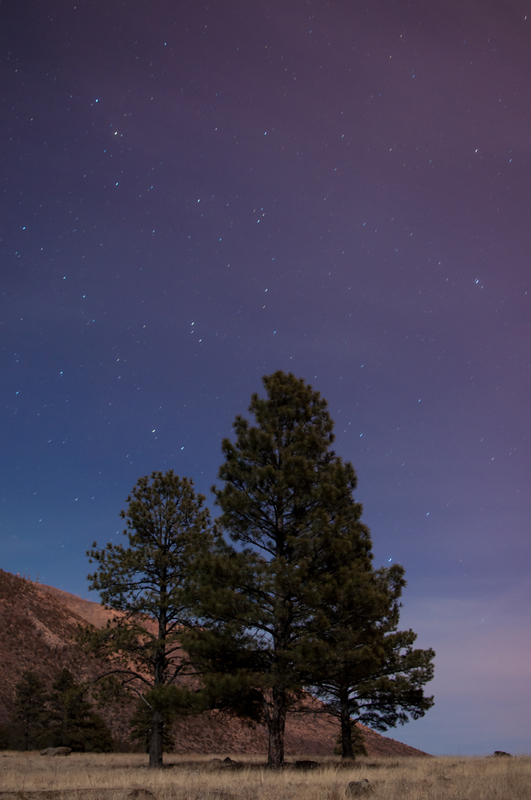 Buffalo Park was our backup plan for the night, originally our eyes were set on shooting the San Francisco Peaks from down at the bottom. We spent a good portion of time searching for good subjects for our star trail photographs, but everyone was getting a bit restless due to the decrease in temperature and windy weather. We decided on a spot just to the left of where this image was taken, and began composing our shots. We agreed to leave our camera in the field while we went to get something to eat down the road. A little over an hour and a half later we come back to the field, but this time we are not alone. We made it no more than 50 yards down the trail before we noticed two pairs of eyes floating near each other off to the right. We froze dead in our tracks, all thinking the same thing, mountain lion. Fear quickly set in and we simultaneously began to inch backwards towards the car to devise a plan. Without actually identifying what we saw, we proceeded, two different times, down the trail in hopes to get them to run away. Armed to the teeth with whatever photo gear we had left to use as weapons in case of a showdown, in our third attempt we decided to just go for it and hope for the best. On this final attempt we discovered the “mountain lions” that we had been terrified were merely two deer eating the grass in the field. This story is not so much about the image and what it depicts, but more about the experience shared in the event that this image was capture in. My photography helps me remember a feeling or an idea during the time I was taking the photo. It allows me to be transported back to the time and place. I can remember a lot of frustration because of the clouds on this particular night. Due to the bright moonlight the landscape was sharp and full of color. The clouds also began to blow off and become more wispy, then becoming illuminated by the moon. All these factors played into my ability to capture the image above. My Name is Matt Valley and I am from Scottsdale, Arizona but currently residing in Flagstaff as a student at Northern Arizona University. I have been shooting photography for about 6 or 7 years now, which has allowed me to experience a lot. I have had the opportunity to shoot a handful of weddings, senior photo shoots, concerts, action sports, families, and in landscape all over Arizona. I cannot say that I prefer a specific subject, however, I can most definitely say I have the most fun shooting people. I love being able to combine the aspects of portraits into beautiful landscape shots. My process depends a lot on pre-visualization. I would not say that I depend on it, but it helps jump start the creative process for my work. I wanted to create an image with lots of emotion using dramatic lighting, shape and balance. My sole goal was to try and capture an image that expresses the passion for what the subject is doing or where the subject is, in this case the subject being someone who is working out at a gym. I really wanted to get a picture that communicates very well visually. On top of the original image I added a few graduated neutral density filters and small tweaks to the highlights and shadows. I wanted the image to have a very dramatic feel to it. A little back-story on this picture is that the idea originally came from a quote I heard. The quote said, “Success shines not only in the light, but in the dark as well.” I wanted to try and create an image that brings that quote to life. I decided to put my passion of photography and my new found passion of living a healthy life together. The person in the image is in fact myself. I wanted to show people where I stand in life and what it means to me in one picture. I have never been healthy throughout my entire life up until 8 months ago when I decided it was time to make a change. It meant and still means the world to me in such a way that I cannot explain. I have accomplished more than anyone including myself would’ve ever thought. 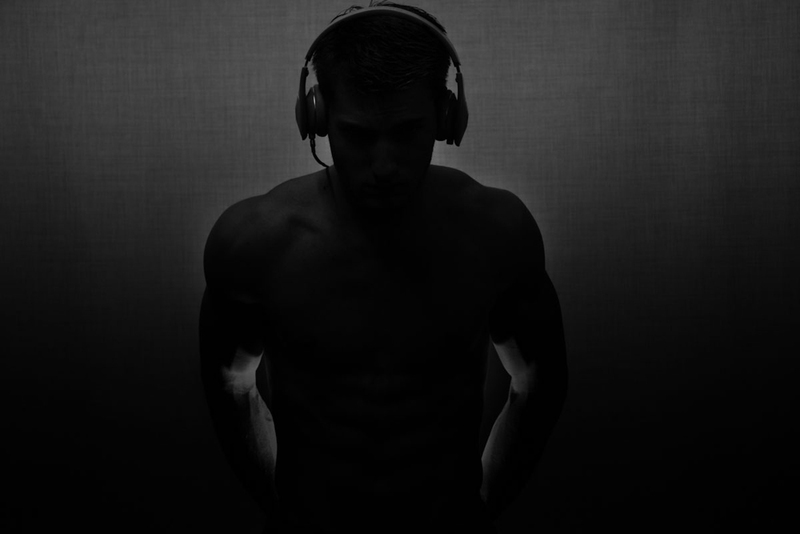 I have worked very hard, keeping to myself in the dark doing what I have to do everyday to get to where I want to be. It has been a lovely road of success that has not been easy for me, and that is what I am trying to capture with this image. On the technical side I used a Cannon Rebel T3i, 18-55mm lens, a simple Dynex tripod, a YONGNUO Speedlight YN560-II flash, and a remote trigger. The aperture was at 5.6, ISO set to 400, and the shutter speed was at 1/100. I have always enjoyed making art that forces people to feel a certain way. I want people to see an image of mine and say that image created some sort of feeling for them. I prefer landscapes, nature, and architecture shots. My work is different from others because I try and capture a subject in ways that people wouldn’t expect. Passion, serenity, precision and love for the moment all exist in my artwork. My main goal as an artist is to be different than others, to have people see one of my images and say, “I haven’t seen that before.” My dedication, passion, and love for photography is what keeps me motivated to provide people with the best possible images I can. I will not settle for anything less than my best. Montana has some of the most beautiful landmarks in the world. The state is in the Western United States and has numerous mountain ranges. We would expect this, since the states name came from the Spanish word montaña, meaning mountain. Montana has a popular slogan, “Land of the Shining Mountains”. The top attractions in Montana are Glacier National Park, Yellowstone National Park, Lewis and Clark National Historic Trail, and the Montana Rockies. I had a cross-country meet in Bozeman, Montana. We had a day off before the meet and my coach and I decided to try to find a spot that we could drive up the mountains. After driving around for quite some time, we finally found a way up. We had to drive through a neighborhood and while doing that, we came across something so beautiful. There were many horses running around in a field so I grabbed my phone and began to take many different shots of the horses with the mountains in the background. I wanted to capture an image that would express Montana’s beauty. When I walked over towards the horse, he ran right up to me. I was so shocked that he was not scared of us. The horse was perfect because he was posing for the image exactly how I needed him to be. Having the mountains in the photo was important to me because I wanted to capture what Montana is known for. I did not have my Canon EOS Rebel T3i camera with me, which was a huge disappointment, so I used my iPhone 5. It was very surprising how well the photo turned out since I did not have my camera, but since I was so close to the horse, it still captured an image that I wanted. The ISO is 50, with an aperture f/2.4 and a shutter speed 1/1550. I later used minor post processing in Adobe Lightroom. I took away something in the field as well as brightened the whites and darkened the shadow on the mountain. This gave the mountain more depth. I learned a lesson that I need to bring my camera with me anywhere I go. I am still using this image because it has a lot of character. 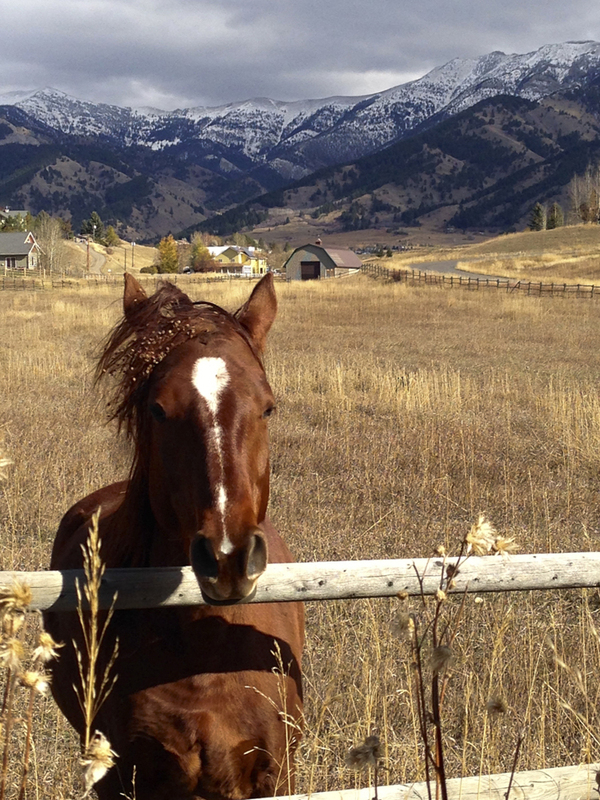 The mountains with the stormy sky give the photograph good color and the horse is placed using the rule of thirds. Some of our best photographs are taken when we least expect it, and this is exactly what happened to me. My name is Jamie Shrader and I am a Biology major with a photography minor at Northern Arizona University. 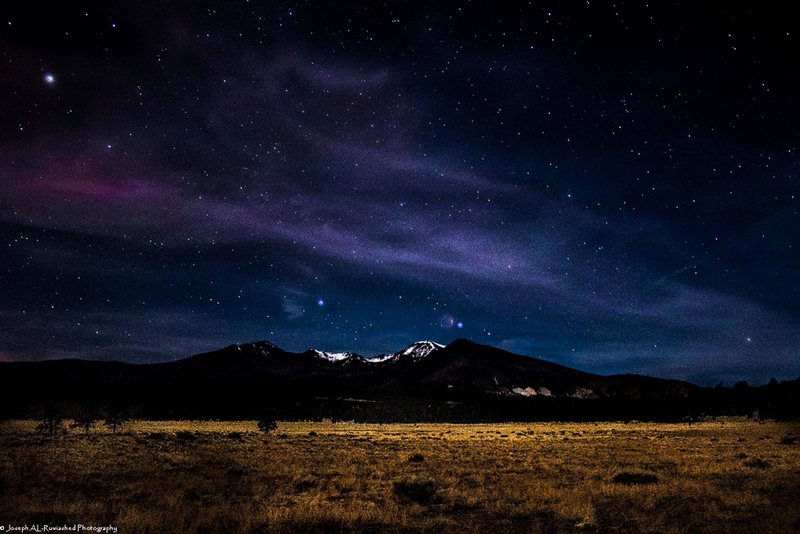 I was born and raised in Flagstaff, Arizona and enjoy to photograph nature. I would later like to specialize not only in nature photography, but in wedding photography as well. I want to capture detail and exclusive beauty through my photographs. My goal is to show people something they have never seen before.